CNP Pro MS is a high protein product based on the same unique premium blend of proteins contained in our flagship product Pro Peptide. Pro MS was developed over many years by world leading protein experts. We have also added complex carbohydrates, vitamins & minerals to make a meal replacement that gives maximum nutrients but in only 255 calories. We use only Low Temperature Processed Micellar Casein, no Caseinate. Micellar Casein is the natural form of Casein in milk. Micellar Casein forms the best “time release” complex in the stomach and intestines. Micellar casein costs much more than caseinates, but we know you are worth the expense. We are passionate about making the best sports nutrition products and our in-house development and blending gives you the confidence that you are getting exactly what you are paying for. Pro MS also contains unique acidophilus and yoghurt organisms. We make this product for you in easy to open and pour sachets to add convenience. Enjoyed this product? 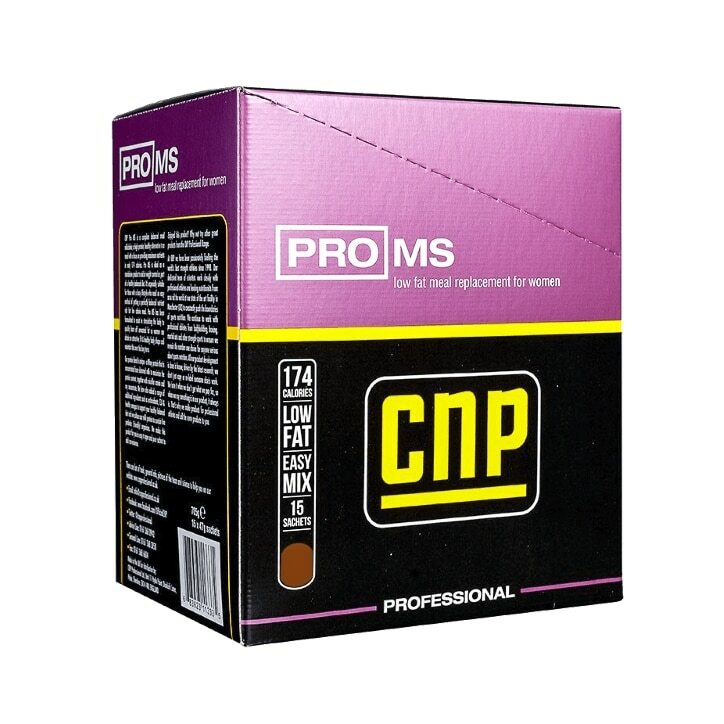 Why not try other great products from the CNP Professional Range. We think it works best if you mix the contents of one sachet with 250 – 300ml of cold water to make thinner or thicker creamy shake to your requirements. Consume 1 or 2 servings per day for weight control as part of a healthy balanced diet. ProMS Proprietary Structured Protein Blend (milk protein cultured with bifidus, acidophilus and yoghurt organisms, whey protein from high fraction concentrate, peptide bonded glutamine, soy protein concentrate), Maltodextrin, Cocoa Powder, Vitamins And Minerals (potassium chloride, dipotassium phosphate, tripotassium citrate, trisodium citrate, salt, tri-calcium phosphate, magnesium oxide, choline bitartrate, vitamin C, vitamin E acetate, beta carotene, iron(II) fumarate, niacinamide, biotin, zinc oxide, potassium iodate, calcium D pantothenate, sodium selenite, chromium(III) chloride, copper sulphate, manganese sulphate, vitamin B12, vitamin D3, folic acid, sodium molybdate, vitamin B6, vitamin B1, vitamin B2, vitamin K), Flavouring, Fructo-oligo-sacchacharide, Proprietary Antioxidant/Fat Burning Blend (MCT oil, sunflower oil, conjugated linoleic acid (CLA), green tea extract, flaxseed), Thickeners (cellulose gum, xanthan gum), Sweetener (sucralose). May contain fish and egg.